I’ve always been the type of person that loves “finger food”. You know.. food that’s convent and easy to eat with fingers; Kinda like appetizers. 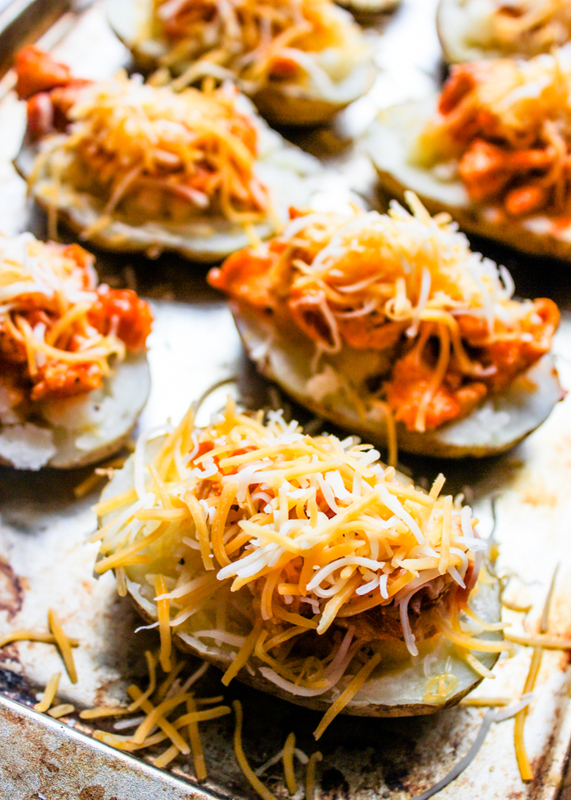 These buffalo chicken stuffed potatoes are perfect for just that because they are not too big or too small. They can be eaten as an appetizers, snack or a meal since they are packed with protein (from the chicken) and calcium (from the cheese). 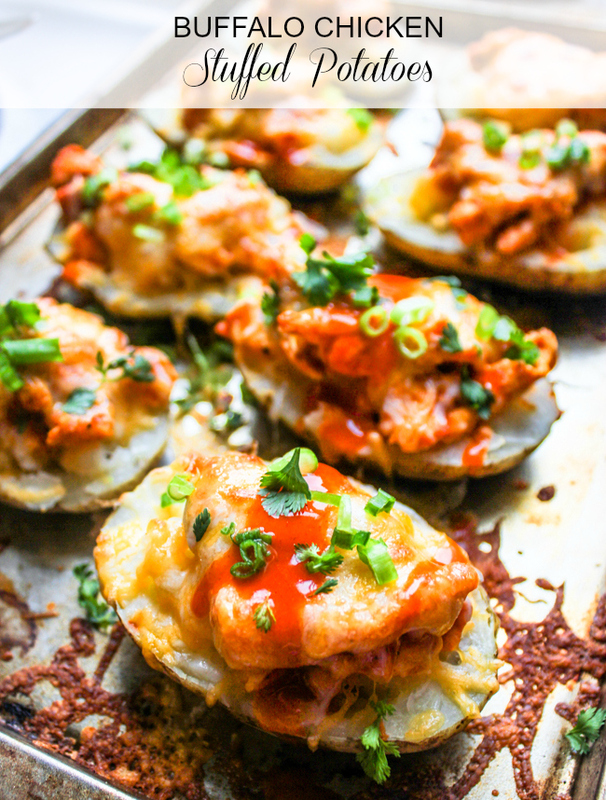 These potatoes are twice baked but are ready from start to finish in 20 minutes or under. 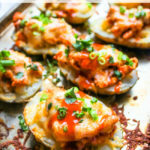 First they are steamed in the microwave for 10 minutes to cook them then filled with a buffalo chicken and cheese mixture and baked in the oven for 5 minutes just to melt the cheese and get the juices flowing. You can also bake the potatoes in the oven instead of the microwave but that will take up to 1 hour. I can never wait that long for my potatoes to bake so the microwave is definitely a better option! Scrub the potatoes and prick several time with the tines of a fork. Place on a plate then cook on full power in the microwave for 5 minutes. Turn over, and continue to cook for 5 more minutes or until the potatoes are soft. When the potatoes are cool and cut in half lengthwise and scoop out the middle (into a medium bowl) leaving about 1/4 inch of potato on the skin. Combine 1/2 cup of the cheese with the scooped potatoes, season with salt and pepper. Return mixture into the potatoes (filling almost full) dividing evenly. Turn on oven broiler. Mix the hot buffalo sauce & melted butter, then mix in the chicken, season with salt and pepper. Fill the rest of the potatoes with the chicken and top with the cheese.Broil until the cheese has melted, just 5 minutes. Garnish with green onions and cilantro. Serve warm. I have just printed this recipe and will try it out tonight. Thank you. WOW! I’m hungry for them and it’s only 7am here in the UK. What camera do you use to take your pictures? OMG these are so genius! They look incredible and so flavorful! Also a sucker for finger foods, although I always end up eating twice as much! Definitely wouldn’t care if I was eating these though, the buffalo, the potatoes — mmmm SO good! Thanks Nicole! I also LOVEEE finger foods!